This whopping write-in activity book contains loads and loads of really simple instructions that will allow children to draw people, animals, vehicles and more. Illustrated step-by-step diagrams feature down the side of each page; there is plenty of space to practice in the middle. A three-book bind-up comprising 'Step-by-Step Drawing', 'Step-by-Step Drawing People' and 'Step-by-Step Drawing Animals'.No extras or special equipment are required - just a pen or pencil. 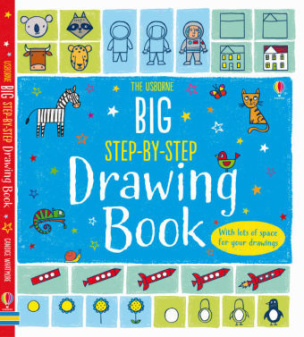 There is lots of space in the book for children to draw in.Also includes ideas on how children can use their new-found drawing skills to create larger pictures.